Family photos can be one of the most exhausting parts of a wedding day. You’ve just gone through months of planning and a day of prepping to get down the aisle. Now you have a bunch of portraits to take before you can get to the celebration. Here are some tips to make portrait photos go as smoothly (and quickly!) as possible. This is so, so important to not only make sure that the photo process goes as smoothly as possible, but also to ensure you get all of the photos that are important to you. Your wedding day is such a whirlwind, filled with a myriad of emotions and so many things going on around you. Don’t rely on your memory to remember all of the different combinations of people you would like photos of on such a big day. Make sure you create your photo shot list at least a few weeks out from your big day to give yourself time to remember any combination you may have forgotten. This shot list should have all combinations with the first names of the people in the photos so that your day-of coordinator can call out names to quickly get people into position. Every family dynamic is different, so every portrait list is different. Be sure to give this photo shot list to both your photography team and your wedding coordinator/planner before your big day. Pro Tip: Arrange the photo combinations in order so that there is the least amount of shuffling of people. Click HERE for an example photo combinations order list. There’s nothing worse when taking portraits than having everyone set up and ready to go for a photo and having to wait 10 minutes for Uncle Kurt to be retrieved from cocktail hour. 10 minutes may not sound like a long time, but when you have multiple portraits to get through and have just gotten married, 10 minutes can seem like an eternity. Make sure that everyone who is in any of the portraits knows where to be and when to be there to avoid any unnecessary delays. Pro Tip: If your family portrait photos are after your ceremony, once the bridal party has made their exit from the ceremony, have your officiant announce that cocktail hour is beginning and for immediate family members to remain in the ceremony space for photos. A day-of wedding coordinator is invaluable on your wedding day – just ask anyone who has decided to forgo one for their day and has had a venue coordinator no show, the photo booth get in a car accident on their way to the event, or have vendors calling with questions. No matter how big or small your wedding is, every couple should have a day-of coordinator. With all the planning and money you’ve put into this day, I promise it is worth a few extra dollars for your peace of mind on your big day. Still not convinced you need a day-of coordinator? Read our blog on why you definitely do by clicking HERE. One of the many ways your day-of coordinator will help with your wedding day is by orchestrating your portrait photos. Your day-of coordinator will call out the names of needed family members/friends in the photos and help arrange them so that your photographer can focus on getting the perfect shot. This helps the process go by much faster and smoother while allowing you and your guests to get back to celebrating as soon as possible! A photo shot list is SO important to ensure you get all the photos you want from your big day. 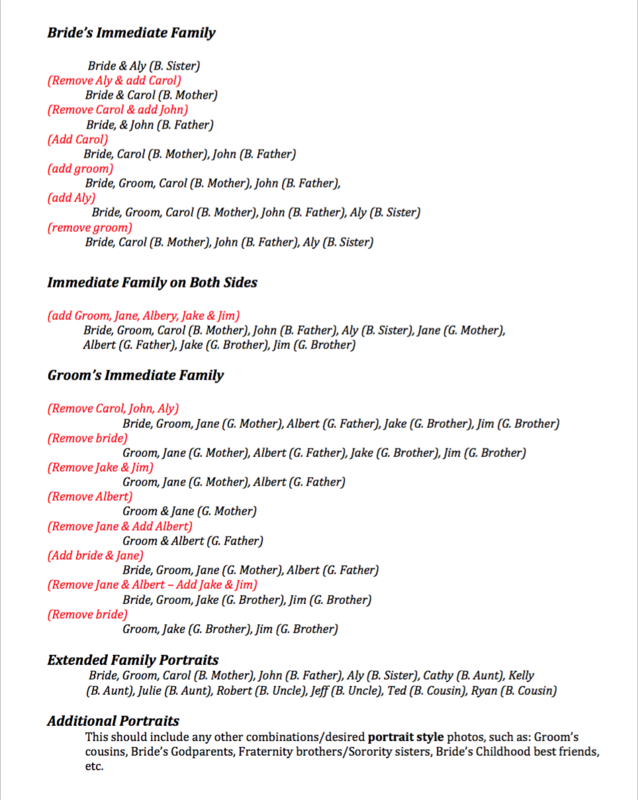 This list will also help the portrait photo process go as smoothly as possible so you can get back to the celebration! The shot list should have all combinations (with the first names of the people in the photos) so that your day-of coordinator can call out names to quickly get people into position for your photographer. Every family dynamic is different, so every portrait list is different. Be sure to give this photo shot list to both your photography team and your wedding coordinator/planner before your big day. Do your best to arrange the photo combinations in an order so that there is the least amount of shuffling of people. Your wedding planner should be able to help you put your combinations in the best order depending on your particular combinations. Below is an example photo shot list. Of course, not all of these combinations will apply to every couple and there may be additional combinations you would like to add. After these portrait photos have been taken, the photography team should take photos of the bridal party and bride & groom. If these photos were taken before the ceremony, take the remaining cocktail hour time as an opportunity to soak in a few moments as husband & wife (perhaps take a quick stroll) and possibly have your photography team take a few more candid style shots while you do so. Need help with your photo shot list or a recommendation for an awesome photography vendor? We’re here to help! Fill out our contact form HERE to get in touch with us.